If you haven’t been following the ebook reader industry carefully, you’ve probably never heard of little-known ereader called the Alex Reader from Spring Design. 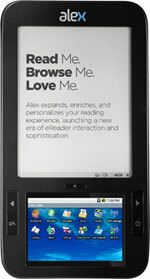 The Alex Reader was supposed to be the first ebook reader with two screens, one E Ink and the other LCD. Barnes and Noble beat Spring Design to the punch, however, by releasing the original 3G Nook in October 2009, several months before the Alex started shipping in Spring 2010. Spring Design ended up filing a lawsuit against Barnes and Noble for misappropriating trade secrets, breach of contract, and unfair competition. The lawsuit is still pending, in fact. Spring Design claims they shared the Alex’s design with Barnes & Noble during a meeting in 2009 regarding a potential partnership and that Barnes & Noble incorporated features of the Alex Reader into the Nook. Whatever the outcome, it looks like the Alex Reader’s days are numbered. I happened to stop by the Spring Design website the other day and noticed that the Alex Reader is listed as “Out of Stock”. I also noticed that there haven’t been any Twitter or Facebook updates since November when the Alex went on sale for $349 (yes, “sale”; it normally sells for $399). Thank you for your interest in Alex. Spring Design is phasing out the current Alex Reader within the next 6 months. We have not announced the product change and introduce any new product yet. So according to the folks at Spring Design, the Alex Reader is indeed being phased out. But is there something new coming along? The second sentence, while a bit off, would seem to suggest that something new is in the works and that they simply have not announced/introduced it “yet”. Remove the “yet” and the outlook isn’t nearly as good.